London-based double bassist and composer Calum Gourlay is known for his deep warm tone, controlled execution as both a supporter and improviser, and rock solid time and pulse. 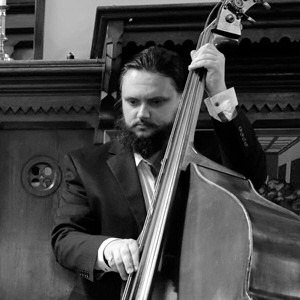 Born in Glasgow, Scotland in 1986, he began his musical journey playing the cello in primary school and by the age of fourteen started the double bass, having developed a serious interest in jazz and improvised music. Gourlay’s talents were noticed by many of Scotland’s premier artists, and as a result he became the first bassist selected for the then ‘brand new’ Tommy Smith Youth Jazz Orchestra as well as other ensembles. In 2004 he started at the Royal Academy of Music in London and graduated with first class honors with a B.Mus. (jazz) degree in 2008. Since then he has become a mainstay on the London scene while performing with the Kit Downes Trio, The Tommy Smith Group, Will Vinson, The Scottish National Jazz Orchestra featuring Joe Lovano, John Scofield, and Kurt Elling, Martin Speake, Martin Kershaw and Sheila Jordan.